In the comments the other day, Belinda from the Frugal Workshop mentioned that there are numerous small ways to save money, but only a few major ways. How true is this. I commented back that I think I must do a dozen small things a day, that save us money. Well, later in the day, I got to thinking, "do I really do a dozen things per day to save us some money, or was I exaggerating?" 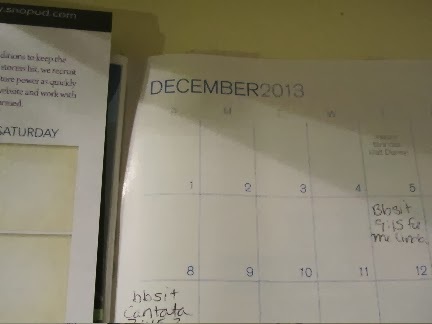 So, I wandered around the house to see what I could find, and took photos, as a reminder for this post. And yes, I did a dozen things, and then some. Here are the first 12 things that I thought of. 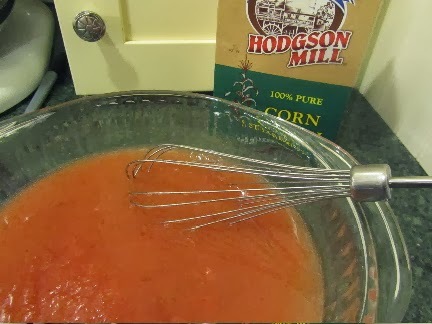 5) I served crabapple sauce, made with crabapples from our tree, to go with dinner. It was too tart the last time I served it, so this time I rescued it with a mixture of cornstarch, sugar and additional water. It was not just passable, but delicious. 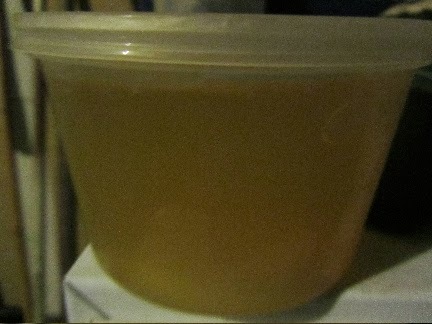 11) I made another batch of citrus and spice cleaning fluid. I now have 2 quarts stored in the laundry closet. and set up January's budget. I think we all do many, many small things each day, which wind up saving us money. The next time you feel down about your frugal efforts, see if you can't make a list of everything you've done lately. You might be surprised at just how hard you work at economizing. 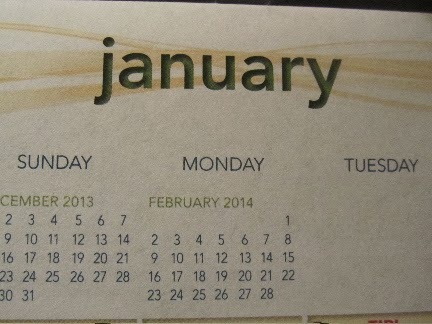 The year is off to a great start, don't you think?! The little savings really do snowball into bigger ones quickly. Keeping my fingers crossed for a little bit of snow for you! A day at home is so nice, after the busy holiday season. Have a great day, yourself! that about sounds like my day (except the pea soup, can't stand the stuff). It's amazing how many little ways we save money, without even thinking about. They add up! I hope that your year is off to a great start! 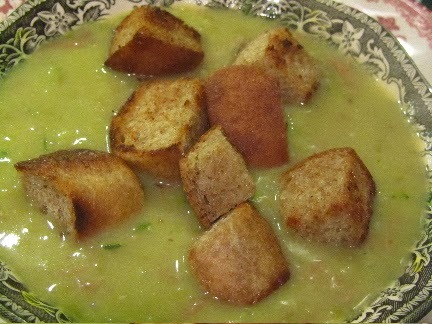 I think pea soup is something you love or hate--no room in the middle on that one. We love it here and my hubby made it for Sunday dinner. We had enough for leftovers Tues evening, which was nice as we had company in the afternoon and I didn't feel like coming up with a meal plan. :) It feels like we are in a spending phase right now--our garage door opener isn't working right so we have to replace the motor unit--yes, manually opening it would be cheaper but standing in snowy, frigid temperatures to do that isn't appealing! :) I think the thing for me is, we do many of the things you posted about today and I don't even think about how they save us money--but when minor "emergencies" like our garage door occur, I don't worry about the money because I know we've got an emergency stash for just such things. 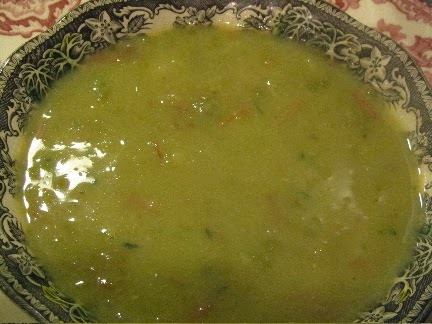 I have to admit, there are days that I don't want split pea soup. But when I have good ham stock, some meat and cream to smooth it all out, it's really good. You are sooooo fortunate to have a husband who cooks! He sounds like a keeper! Ugh! repairs! I hope you can find a good deal on a new motor for your garage door opener. I think there are some little luxuries that just make sense. 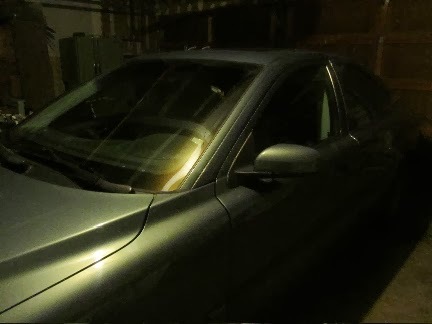 An automatic garage door seems to be one of them, especially in bad weather. And they offer a bit of security, too. A manual door could be opened by anyone walking in off the street. The automatic ones, not so easy. So, it's not just convenience, but some security as well. 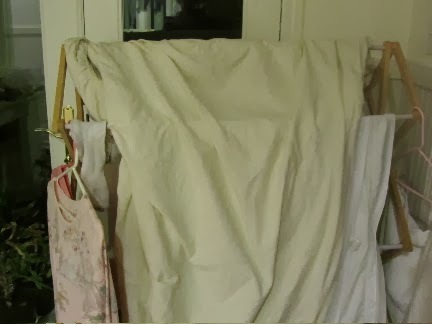 My mom used to hang all of our laundry to dry, except sheets and towels. She used drying horses indoors in winter, and a line outdoors in summer. Are those sheets on your drying-rack? Do you ever have trouble getting them to dry indoors? How do you make your croutons, in the oven or on the stove-top? Is there a best/better way to make them? There are a couple of things that we do to get towels and sheets (even flannel ones) to dry indoors. 1) we can put one of the racks in front of the fireplace insert, 2) we can place a rack over a floor heat register 3) we can place a rack in the kitchen in front of an oven that's on, or has just been on, and 4) we can run one of the summer table fans directed at the side of the rack, increasing air movement around the drying linens, and thus they dry faster. In a pinch (when I need the towels to dry faster), I put them in the tumble dryer for 10 minutes before hanging on the racks. This cuts several hours off the total drying time, the difference between having dry towels the next morning, or dry towels not until the next evening. You do what it takes to make it work for yourself. I know a lot of folks just hang their clothing to dry, but tumble dry the linens. And that in itself is a savings. But also, maybe time is better spent, in some circumstances, just using the tumble dryer, but doing other productive activities. If I had a full-time career, I'm pretty sure I would only be using my dryer, and not hanging clothes to dry. When I have particularly busy weeks, (like the week that I'm getting the garden all planted), I do use the dryer. Getting the garden in takes priority at that time. Croutons -- I do it both ways. The stove top is energy efficient if I'm only doing croutons, and not already using the oven for something. 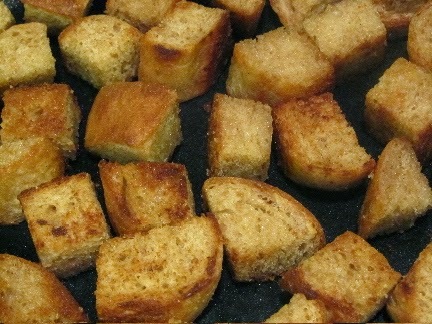 In my kitchen, stove top croutons tend to be softer in the center, so crispy outside, soft inside. And oven croutons tend to dry all the way through. I think it's a matter of what you prefer. Stove top croutons require my watchful eye, so they don't burn. Oven ones, just a quick stir half way through. So, to give you a definitive and concise answer, there is no one right way to make croutons. Sorry if that didn't help at all. What is in your citrus and spice cleaning solution and what do you clean with it? It has to be better than harsh chemicals! 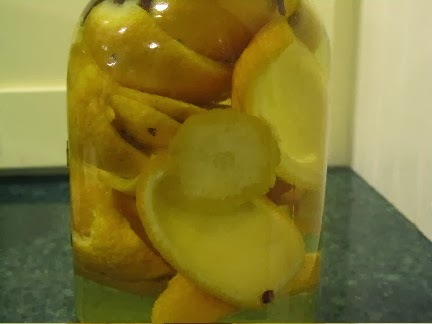 It's orange peels and whole cloves infused in vinegar for a couple of weeks, then strained. I use it mixed with water to mop the vinyl floors (kitchen and baths), and to clean toilets, sinks, tubs, stove-top, microwave and patio furniture. It's my basic all-purpose cleaner. It doesn't do everything (can't use it on granite, marble or other natural stone), and it doesn't kill mildew. But it has a pleasant scent, nothing harmful, and it's super cheap! Oh and once strained, it keeps in a cool cupboard for many months. I'm trying to make enough this winter to have a supply that will last until fall next year. I ran out mid-summer this past year. Thank you - I'll give it a try. I just threw out an orange peel last night and as I did so - I thought "I probably could use this in something". 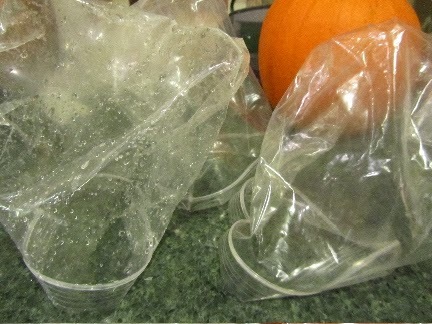 Also, have you ever made dishwasher soap? It is another pricey cleaning aid. I just use a dollar store dish detergent. 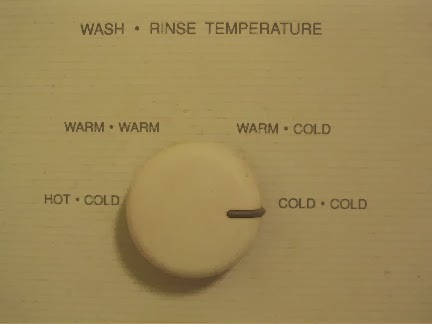 It's the Sun brand, for automatic dishwashers. Our water is soft here, so 1 tablespoon is enough for a load. A box of Sun that costs $1 at Dollar Tree lasts us about 6 weeks. Before switching to Sun, I was buying Cascade powder. And for us, Sun seems to work as well as Cascade powder. Your water may be hard, and you could have totally different results. I have recipes for both automatic dish soap and liquid hand washing soap, that I will price out this winter and see if they work. My family gave me a book on homemade cleaning/personal care solutions for Christmas. It does have a lot of recipes in it. But I haven't tried them out to know if they work as well as what I have. As soon as I try one of them out, I'll post the results, recipes and costs. I love your dozen! I think the best thing about reading frugal blogs is that it keeps me motivated to carry on with all the little things. thanks. 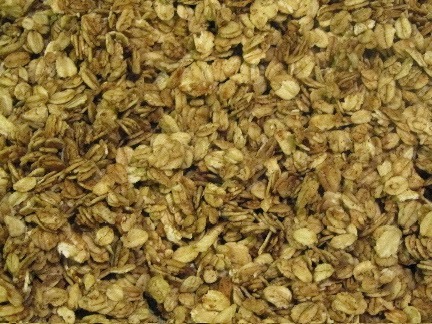 And I didn't post about the best something or other recipe ever, or a new-fangled gadget that saves me oodles of money. My list is just the simple things that we all do every day that keep our finances on track. Definitely, motivation and camaraderie are what bring me to frugal living blogs, too. A very inspiring list and you make it all seem so simple, Lili. As I said in my post, I think we're all doing many things each day, that save us some money. Your list may look different from mine, but your work does just as much to save money for your family. But thank you! 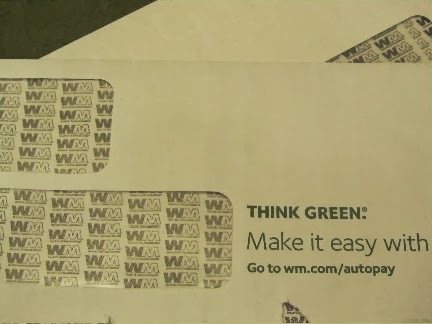 It's great to see how all the little ways of saving money add up. I'm going to try and notice the small things I'm doing as well. All those small things add up quickly. You do many small things each day, which make it possible for you to live well on a student's budget! Your traveled to Thailand, fly home for Christmas each year, cook with good quality foods, can afford to live without roomies -- these are all things that most students would say just aren't possible on the small amount that you're paid for your grad work. But because you've learned many ways to save money, it is possible for you. The cloves add fragrance, as well as anti-septic qualities (albeit a small amount of anti-septic). But I like it. So much in fact, I actually enjoy mopping the kitchen floor!